Puppies sold at Petland, a national pet store chain, have been traced as the likely source of an infection outbreak in seven states. Between September 2016 and August 2017, Campylobacter infections have been reported in Florida, Kansas, Missouri, Ohio, Pennsylvania, Tennessee, and Wisconsin, according to the U.S. Centers for Disease Control and Prevention. The infection, which can spread to people from puppies and dogs, has sickened 39 people. Twelve people affected were employees, and 27 people affected had either purchased a puppy at Petland, visited a Petland, or live in a home with a puppy purchased at Petland. Nine have been hospitalized. "Evidence suggests that puppies sold through Petland are a likely source of this outbreak," the CDC said in a statement. 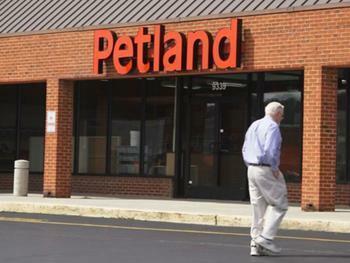 "Petland is cooperating with public health and animal health officials to address this outbreak." People with the Campylobacter infection might show no signs of illness or might have diarrhea (sometimes bloody), vomiting, abdominal pain, or a fever within two to five days of exposure. The symptoms lasts about a week without treatment, but health officials say the illness can be life-threatening for people with weakened immune systems, such as young children, older adults, and pregnant women. According to the Washington Post, Campylobacter infections are most often caused by eating raw or undercooked proteins, but they can also be spread through contact with dog feces. Because infected dogs don’t always show symptoms of illness, it’s vital that consumers take precautions when around dogs. “Regardless of where they came from, any puppy and dog” can carry the germ, the CDC stated. To reduce your risk of catching the infection, the CDC recommends washing your hands thoroughly after touching dogs, their poop, or their food. Additionally, pick up and dispose of dog poop -- especially in areas where children might play. Take your dog to the vet right away if you notice any signs of illness. Choose a dog that is bright, alert and playful. Look for a shiny, soft coat that doesn't have any feces on it. Take your new puppy or dog to the vet for a check-up within a few days of their adoption.